18.8mm to 14.5mm joint size adapter for 14.5mm bowls and 18.8mm joint size at the bong. 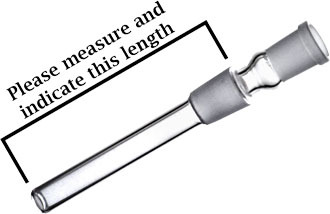 The lenght of the 18.8mm to 14.5mm connectoris measured from underneath the bowl down to the end of the tube. How do I order the correct length of the 18.8mm to 14.5mm adapter? 2.Please give the measured length for your 18.8mm to 14.5mm adapter in the field Comments at the end of your ordering process We'll cut your 18.8mm to 14.5mm adapter accordingly. Boost Bong 38cm 18.8mm "U-Turn"